Virgil Abloh (/ˈæbloʊ/; born September 30, 1980) is an American fashion designer, entrepreneur and DJ who has been the artistic director of Louis Vuitton's men's wear collection since March 2018. Apart from his work at Louis Vuitton, Abloh serves as the chief executive officer of the Milan-based label Off-White, a fashion house he founded in 2013. He entered the world of fashion with an internship at Fendi in 2009 alongside rapper Kanye West. The two then began an artistic collaboration that would launch Abloh's career into founding Off-White. Time magazine named him one of the 100 most influential people in the world in 2018. Abloh was featured in conversation with his friend and frequent collaborator Takashi Murakami on the cover of the fall 2018 issue of Cultured magazine. Virgil Abloh was born on September 30, 1980, in Rockford, Illinois, to Ghanaian immigrant parents. His mother was a seamstress. His dad was a manager in a paint company. Abloh was raised in Rockford, where he attended Boylan Catholic High School, graduating in 1998. He graduated from the University of Wisconsin–Madison in 2002 with a Bachelor of Science degree in civil engineering. He received his Master of Architecture at the Illinois Institute of Technology in 2006. While Abloh was attending the Illinois Institute of Technology there was a building created called the Rem Koolhaas which helped spark his interests for fashion. After graduating from university, he interned at Fendi in the same class as rapper Kanye West in 2009. Placed in the company's Rome, Italy office, the two began a collaborative relationship. During his collaborative work with the rapper and designer, he caught the eye of the Louis Vuitton CEO, Michael Burke, through his work at Fendi. Later that year, Abloh and Kanye West's companion, Don C, launched a retail store, called the RSVP Gallery, located in Chicago. Their founded retail space became known for carrying a mixture of fashion apparel, and for its reflection of Virgil's style on his design for the store interior. A year later, West appointed Abloh the creative director of his creative agency, DONDA. In 2011, West asked him to serve as the artistic director for the 2011 Jay-Z/Kanye West album Watch the Throne. In 2012, Abloh launched his first company, Pyrex Vision. Abloh purchased deadstock clothing from Ralph Lauren for $40, screen-printed designs on them and sold them for prices upward of $550. He closed the company down a year later as he did not intend it to be a commercial enterprise but an artistic experiment. —Abloh on the inspiration behind founding high-end streetwear label, Off-White. Abloh founded his first fashion house and second business overall in 2013 with the high-end streetwear brand Off-White. Based in Milan, Italy, the company was described by Abloh as "the gray area between black and white as the color off-white" to investors and fashion critics. During the launch of his brand, he received help from the New Guards Group, who also assisted many other designers and brands, such as Palm Angels, Heron Preston, and Marcelo Burlon. Abloh's brand lead towards a widespread gain of attention for his apparel beginning in Paris, then expanding to China, Tokyo, Japan and the United States. The clothing line can be identified through its use of quotation marks, zip-ties, capital letters and barricade tape. He launched the company's women's wear line in 2014 and showed the collections at the Paris Fashion Week. His line was selected as a finalist for the LVMH Prize, an industry award, but lost to Marques'Almeida and Jacquemus. Abloh launched his first concept store for Off-White in Tokyo, Japan, where he started the company's furniture arm, Grey Area. In 2017, he was asked to design a new collection in conjunction with Nike entitled "The Ten" where he re-designed a variety of the company's best-selling shoes. Through Abloh's re-designing he exercised his self-made rule of only editing the shoes 3% of the way because he was intrigued by still maintaining the original design of the shoe. Virgil also partnered up with the Swedish furniture company IKEA to design furniture for apartments and houses. The collection will be named Markerad which is a Swedish word meaning "clear-cut; crisp; pronounced" and is scheduled to release in 2019. Virgil envisions the collection to include practical furniture that features contemporary designs. Abloh has worked towards fulfilling his vision for the collection by sketching out drafts of generic pieces of furniture, while adding his own aesthetics to the designs by using a doorstop to level out furniture items. Abloh worked on designs for chairs, coffee tables, beds, storage cabinets, mirrors and carpets apart of his collaboration with IKEA. Abloh uses quotation marks to convey detachment from society and social norms. During the rise in neo-nationalism in 2017 Abloh worked with conceptual artist Jenny Holzer to create a line emphasizing the positive aspects of immigration, cultural integration, and globalization. In December 2017, he worked with Holzer again to design T-shirts for Planned Parenthood in response to the Women's March on Washington. 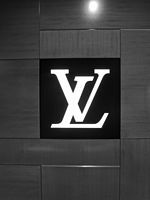 Abloh incorporated the LV logo in his debut menswear collection for the brand. On March 25, 2018, Abloh was named artistic director of Louis Vuitton's menswear ready wear line, marking him the first person of African descent to lead the brand's menswear line, as well as one of the few black designers at the helm of a major French fashion house. Upon his acceptance of the position, he stated, "It is an honor for me to accept this position. I find the heritage and creative integrity of the house are key inspirations and will look to reference them both while drawing parallels to modern times". Abloh showed his first collection for Louis Vuitton at the 2018 Men's Fashion Week at the Palais-Royal gardens in Paris. Rihanna was the first person to wear Abloh before the show. Playboi Carti, Steve Lacy, A$AP Nast, Dev Hynes, and Kid Cudi walked for the fashion show. Abloh has since been in high demand for his designs, creating an original outfit designed for Serena Williams to wear throughout the 2018 US Open, a collaboration with Nike. In March 2019, Abloh collaborated with Ikea to start making furniture for millennials, ranging from cabinets, rugs, coffee tables, and chairs. Abloh has incorporated different elements of style, such as his quotation marks around certain words and putting it on different articles of clothing, and in this case different types of furniture. For example, Abloh created a “Door Stop Interruption” on a chair by adding a doorstop on one of the chair legs to make it elevated. One of Abloh's most popular items is the Frakta Bag. It is beige with the text "SCULPTURE" imprinted on the side. Virgil teamed up with SSENSE to release a workout collection on March 29th, 2019 . This collection contains a variety of workout clothes ranging from; matching leggings and sports bras, athletic sweaters and crop tops. This collection incorporates some of Virgil’s signature designs by including the Off-White yellow sign wrapping around the waste of the pants and bottom of the sports bras. Virgil also includes a three-dimensional addition of his four-way arrows, creating a cross, on the front of the tops and pants. Virgil Abloh has been working with artist Takashi Murakami. Murakami’s artwork is identified by his character “Mr.DOB”; a smiley anime-influenced head with round ears and big eyes. In 2010 Abloh met Japanese contemporary artist, Takashi Murakami while creating the “Graduation” album cover for American rapper, Kanye West. In 2018, Virgil collaborated with Japanese contemporary artist, Takashi Murakami. The artists discuss their careers and the collaboration at length in their interview for Cultured magazine's fall 2018 issue where they are featured as the cover stars. Abloh was given a solo art show in Murakami’s Kaikai Kiki art gallery in Tokyo, Japan. Currently, Virgil Abloh is expected to have his first solo art exhibition at the Museum of Contemporary Art in Chicago. There have been numerous occasions where their artwork has been showcased such as the Museum of Contemporary Art in Chicago, Tokyo’s Oz Zingaro, and the Gagosian show in London. Abloh and Murakami have also collaborated to produce "America Too", a show featuring 35 works that is on display at Gagosian gallery Beverly Hills outpost through October 25. In June 2018, the two had an art exhibition at the Gagosian Gallery in Paris, France. Named “Murakami & Abloh, Technicolor 2” Takashi states in an interview “We’re both from different fields: I’m multidisciplinary, he practices his art and so where we meet in the middle are these contemporary icons of current culture. Abloh met his wife, Shannon Sundberg, in high school. They married in 2009. He maintains a house in Lincoln Park, Chicago, with his wife and their two children, Lowe and Grey. He travels 350,000 miles a year for his work. He is of the Ewe ethnicity of the Volta region in Ghana. Abloh received his first major award in 2011 when his work designing the cover art for the 2011 Jay-Z/Kanye West album Watch the Throne was nominated for a Grammy Award for Best Recording Package. In 2015 Abloh for Off-White ℅ Virgil Abloh was one of the finalists for the LVMH Prize. Abloh was the only American designer to be nominated for the award. Abloh's Charlie Hebdo-inspired “War is Not Over!” tees as well as his toppers from his fall 2015 women's collection gained him the most traction. He received the Urban Luxe award at the 2017 British Fashion Awards. He also won International designer of the Year at the GQ men of the year awards in 2017. Derived from predominantly his role as creative director for his brand Off-White as well as collaborations with Nike. Abloh's Off-White Air Jordan “the Ten” collaboration won 2017's Shoe of the Year, received nods for Accessory Designer of the Year. Abloh was listed as one of Time magazine's 100 most influential people in the world in 2018, one of two designers named that year. In an article for Time, Japanese artist Takashi Murakami said that he was impressed of Abloh's feats that lead him to one of two designers on the list. In 2019 Abloh was nominated for Menswear Designer of the Year. Wikimedia Commons has media related to Virgil Abloh. ^ a b c d Grobe, Max (March 28, 2018). "How Virgil Abloh Went From DJing to the World's Biggest Luxury House: a Timeline". Highsnobiety. Retrieved April 1, 2019. ^ Roffino, Sara (September 2018). "Virgil Abloh and Takashi Murakami are Changing the Conversation One Collaboration at a Time". Cultured magazine. Retrieved February 17, 2019. ^ a b c d e f g h i j k l m n o p q r s t u v Yotka, Steff (March 28, 2018). "A Brief History of Virgil Abloh's Meteoric Rise". Vogue. Retrieved April 21, 2018. ^ a b c Friedman, Vanessa; Paton, Elizabeth (March 26, 2018). "Louis Vuitton Names Virgil Abloh as Its New Men's Wear Designer". The New York Times. ISSN 0362-4331. Retrieved April 21, 2018. ^ "5 things you need to know about Virgil Abloh". TRACE (in French). 2018-03-30. Retrieved 2018-12-18. ^ Rock, Michael (February 6, 2017). "Virgil Abloh - Columbia GSAPP". Columbia GSAPP. Retrieved April 21, 2018. ^ Morency, Christopher (September 29, 2016). "The Unlikely Success of Virgil Abloh". The Business of Fashion. Retrieved April 23, 2018. ^ "Virgil Abloh teases a rug from Ikea and Off-White collaboration". Curbed. Retrieved April 8, 2018. ^ "Virgil Abloh Gives a Master Class on His IKEA Collaboration Design Process | Architectural Digest". Architectural Digest. Retrieved April 8, 2018. ^ Leach, Alec (August 30, 2017). "Why Does Virgil Abloh Put Everything in "QUOTES?"". Highsnobiety. Retrieved May 4, 2018. ^ Madsen, Susanne (June 16, 2017). "Virgil Abloh on getting political with Jenny Holzer". Dazed. Retrieved April 21, 2018. ^ Mak, Hunter (December 1, 2017). "Virgil Abloh & Jenny Holzer Create T-Shirt for Planned Parenthood". HYPEBEAST. Retrieved April 21, 2018. ^ "Louis Vuitton Appoints Virgil Abloh As Its New Menswear Designer". Harper's BAZAAR. March 26, 2018. Retrieved April 25, 2018. ^ "Of Course Rihanna Is the First to Wear Virgil Abloh's Louis Vuitton". Vogue. Retrieved 2018-06-26. ^ "Nike, Virgil Abloh, & Serena Williams Are Teaming Up For The U.S. Open". Retrieved 9 October 2018. ^ McGarrigle, Lia. "Here Is the Full Virgil Abloh x IKEA Collection With Pricing Details". HIGHSNOBIETY. Retrieved 8 April 2019. ^ Gibson, Eleanor. "IKEA offers first look at furniture designed for millennials by Virgil Abloh". Dezeen. Retrieved 8 April 2019. ^ Hopkins, Mayzie (March 28, 2019). "Off-White's first fitness collection is here". VMagazine. Retrieved April 11, 2019. ^ "SSENSE : Off-White "WORKOUT" Capsule". March 29, 2019. Retrieved April 11, 2019. ^ "TAKASHI MURAKAMI". Gagosian. Retrieved 8 April 2019. ^ Roffino, Sara. "VIRGIL ABLOH AND TAKASHI MURAKAMI ARE CHANGING THE CONVERSATION ONE COLLABORATION AT A TIME". Cultured. Retrieved 8 April 2019. ^ "VIRGIL ABLOH AND TAKASHI MURAKAMI ARE CHANGING THE CONVERSATION ONE COLLABORATION AT A TIME". Cultured. ^ "VIRGIL ABLOH AND TAKASHI MURAKAMI ARE CHANGING THE CONVERSATION ONE COLLABORATION AT A TIME". Cultured Magazine. ^ Cowen, Trace William. "Virgil Abloh's First Solo Art Show Debuts at Takashi Murakami's Tokyo Gallery This Month". Complex. Retrieved 8 April 2019. ^ Therrien, Allison. "MURAKAMI & ABLOH "AMERICA TOO"". Gagosian. Retrieved 8 April 2019. ^ Foreman, Katya (June 23, 2018). "Virgil Abloh and Takashi Murakami Talk Making Art Via WhatsApp". WWD. Retrieved April 12, 2019. ^ a b c Solway, Diane (April 20, 2017). "Virgil Abloh and His Army of Disruptors: How He Became the King of Social Media Superinfluencers". W Magazine. Retrieved April 24, 2018. ^ "This Just In: Meet the LVMH Prize Finalists". ^ "Virgil Abloh and Asap Rocky at The 2017 GQ Australian Men of the Year Awards". PAUSE. Retrieved 1 April 2019. ^ Carballo, Charlie. "Virgil Abloh and Tabitha Simmons Are Among the CFDA Awards Nominees". Footwear News. Retrieved 1 April 2019. ^ Wolf, Cam (April 19, 2018). "Virgil Abloh Is One of Time's 100 Most Influential People in the World". GQ. Retrieved April 21, 2018. ^ Murakami, Takashi. "Virgil Abloh". Time. Retrieved 1 April 2019. ^ Carballo, Charlie (March 19, 2019). "Virgil Abloh and Tabitha Simmons Are Among the CFDA Awards Nominees". FootwearNews. Retrieved April 12, 2019.